They say the first year of anything—marriage, parenthood, moving home after living abroad—is said to be the hardest. I don’t know who ‘they’ are, but I assume their theory has something to do with all those long, sleepless nights. And while I’ve not yet dipped my toe into the grown-up world of marriage or babies, today I am celebrating the first birthday of my own labour of love. It has been 365 days since I took a deep breath and with the click of a mouse published my first post on Blonde Ambition. It hasn’t always been easy; there have been times when I suffered writer’s block, when I wondered if I was just a bit boring (yes) or when WordPress played hide and seek with my revisions (where the h*ll is it? You stupid computer!). But I am so thankful to those who encouraged me throw open the windows to my quirky little world so everyone, including those people I really don’t like but haven’t worked out how to block—you know who you are—can peer inside. This blog is my online home. Except that unlike my ‘real’ home, I’d actually really like people to visit—you can even stay for a while, have a look around, maybe comment on a post or two. It’s not that I shy away from visitors in my ‘real’ home (well, only a little bit) but mostly it’s because when I’m home alone, I can fly my little freak flag to my heart’s content. Like on Sunday night; I was chilling out on the couch watching TV when a piece of my wet hair fell in my eye and I thought it was a spider, freaked out, smacked myself in the eye and fell off the couch. It was an attack of the frightening hair spider! I share this meaningless anecdote with you as proof that when it comes to functioning like a proper adult, I’m not quite there yet. Or maybe I am and this is as good as it’s going to get. Which is why I hope that is why you keep coming back, because deep down, everyone’s a little bit freaky or weird or quirky. So, for those who didn’t see my 10,000 hits post, thanks for reading and come and visit again soon (just be sure to wipe your feet on the way in as vacuuming this place takes FOREVER). May the year ahead be as fortunate for you as the past 12 months have been for me. Must go now —I have to go complete my fancy new exercise regime of dancing around my lounge room to LMFAO. 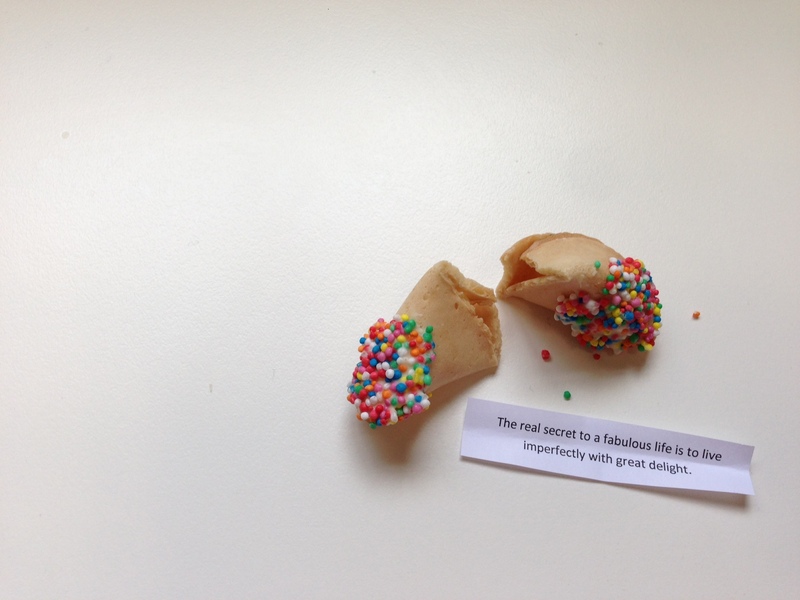 Editor’s note: If you want one of my fancy fortune cookies, comment below. Just kidding, you’ll actually have to make them yourself. Simply grab a box of fortune cookies, dip the ends in melted chocolate and coat with your favourite sprinkles! Congratulations Brooke. To open your world, in all its quirkiness, with any and all who wish to take a peek is a remarkable achievement. And here’s hoping there are many more of us who aren’t proper adults yet. Life needs it. Thanks Christiaan! It was definitely nerve wracking to put myself out there in the beginning, and still is in a way, but if I bring a bit of laughter to someone’s day or show them we’re all a bit weird, then it’s all okay. Plus it’s a bit of a cool way to keep a diary of what my 30s are like! Congratulations on your bloggy birthday! Thanks Francesca! Love the Fiesta of Favourites concept.